In the above diagram, the impedance of the subs add together. The negative of one speaker connects to the positive of the other. Above, the positives of each speaker are wired together. The negatives are wired together. This is parallel woofer wiring. As the diagram shows, the new impedance of the combined load (or combined speaker wiring) is half of the individual car subwoofer impedance. The two 4 ohm speakers create a new 2 ohm load. This is the normal load that most mono car bass amps will drive easily. The combined total impedance here is 8 ohms. If the speakers were 4 ohms each, then the combined impedance would be 4 ohms. The two speakers wired in series add to each other. Since there are two sets of these, when they are then wired in parallel to each other, each pair is reduced in half as if they were one speaker, just like regular parallel wiring. Therefor, the two 8 ohm speakers in series became 16 ohms, then two 16 ohm “speakers” wired in parallel become 8 ohms. This shows that multiple woofers can be wired to achieve a normal load and therefor can be driven by a single amp. 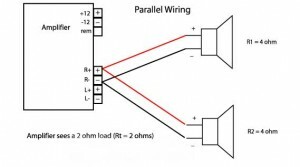 If all 4 of the above 8 ohm speakers were wired in parallel only, then the combined load would be 2 ohms. If they were 4 ohm woofers and all wired in parallel, then the new load would be one ohm. This would be great for a One Ohm stable amp, but many car stereo power amps can not drive a one ohm load. If too low a load is put on the amp, it will become very hot, blow a fuse and shut off, or burn up. Four 4 ohm subs wired series/parallel as above diagram, will give a single 4 ohm load and can easily be driven by any power amp. Diagram shows two DVC 2 Ohm subs with each subwoofer’s voice coils wired in series to form a 4 ohm speaker (2 + 2 = 4), then the two 4 ohm subs are wired in parallel with each other to form a single 2 Ohm Load. Questions on Subwoofer Wiring Diagrams or Installation? Come into Our Store See for yourself and Speak with a real Car Audio Expert!